The Tax Division performs mandated property tax functions, including extending the property tax rolls, accounting for funds allocated to community redevelopment agencies, processing direct assessments, apportioning property taxes collected, and processing tax refunds and cancellations. Areas - County Unincorporated Areas are those areas and communities that are outside the jurisdictional boundaries of incorporated cities. As such, they are not serviced by an incorporated city. County government serves as the "city" for these areas by providing basic municipal services such as law enforcement, zoning, building permits, libraries, parks, recreational programs, street maintenance, and traffic signals and stop signs. Areas - Cities Incorporated Areas is the establishment of a city that any proposed city incorporation must have at least 500 registered voters residing within the affected area at the time commission proceedings are initiated. Districts School District is taxing jurisdiction that includes elementary, high school, unified school districts, and community colleges. For purpose of tax apportionments, it also includes the Educational Revenue and Augmentation Fund (ERAF). DistrictsSpecial Districts are public agencies that provide specific services directly to local communities. Agencies In most cities, the city council members are also the governing board for the redevelopment agency, however, the council and the agency are two separate, distinct legal entities. The agency members hire staff to carry out the day-to-day operations and its redevelopment plans. In most counties, the board of supervisors is the governing board. Secured Levy A Secured Levy is tax on real property, such as vacant land, structures on land, i.e. business/office building, home, apartments, etc. Unsecured Levy An Unsecured Levy is tax on assessments such as office furniture, equipment, airplanes and boats, as well as property taxes that are not liens against the real property. Exemption Homeowner Exemption is a state exemption granted to a property owner who files for the exemption with the assessor and is using the property as their principal place of residence. Unitary is a property that is assessed by the state board of equalization (SBE). As opposed to the regular secured and unsecured properties which are assessed by the local County Assessor. Districts Special Districts are public agencies that provide specific services directly to local communities. Unitary Levy Unitary is a property that is assessed by the state board of equalization (SBE). As opposed to the regular secured and unsecured properties which are assessed by the local County Assessor. Unincorporated Areas - CountyUnincorporated Areas are those areas and communities that are outside the jurisdictional boundaries of incorporated cities. As such, they are not serviced by an incorporated city. County government serves as the "city" for these areas by providing basic municipal services such as law enforcement, zoning, building permits, libraries, parks, recreational programs, street maintenance, and traffic signals and stop signs. Incorporated Areas - CitiesIncorporated Areas is the establishment of a city that any proposed city incorporation must have at least 500 registered voters residing within the affected area at the time commission proceedings are initiated. 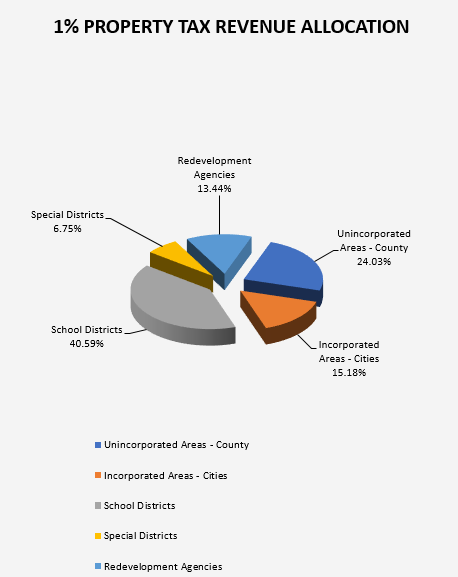 School DistrictsSchool District is taxing jurisdiction that includes elementary, high school, unified school districts, and community colleges. For purpose of tax apportionments, it also includes the Educational Revenue and Augmentation Fund (ERAF). Special DistrictsSpecial Districts are public agencies that provide specific services directly to local communities. Redevelopment AgenciesIn most cities, the city council members are also the governing board for the redevelopment agency, however, the council and the agency are two separate, distinct legal entities. The agency members hire staff to carry out the day-to-day operations and its redevelopment plans. In most counties, the board of supervisors is the governing board. Secured LevyA Secured Levy is tax on real property, such as vacant land, structures on land, i.e. business/office building, home, apartments, etc. Unsecured LevyAn Unsecured Levy is tax on assessments such as office furniture, equipment, airplanes and boats, as well as property taxes that are not liens against the real property. Homeowner ExemptionHomeowner Exemption is a state exemption granted to a property owner who files for the exemption with the assessor and is using the property as their principal place of residence. UnitaryUnitary is a property that is assessed by the state board of equalization (SBE). As opposed to the regular secured and unsecured properties which are assessed by the local County Assessor. A Secured Levy is tax on real property, such as vacant land, structures on land, i.e. business/office building, home, apartments, etc. Homeowner Exemption is a state exemption granted to a property owner who files for the exemption with the assessor and is using the property as their principal place of residence. Incorporated Areas is the establishment of a city that any proposed city incorporation must have at least 500 registered voters residing within the affected area at the time commission proceedings are initiated. View the list of Incorporated Areas. School District is taxing jurisdiction that includes elementary, high school, unified school districts, and community colleges. For purpose of tax apportionments, it also includes the Educational Revenue and Augmentation Fund (ERAF). View the list of School Districts. In most cities, the city council members are also the governing board for the redevelopment agency, however, the council and the agency are two separate, distinct legal entities. The agency members hire staff to carry out the day-to-day operations and its redevelopment plans. In most counties, the board of supervisors is the governing board. An Unsecured Levy is tax on assessments such as office furniture, equipment, airplanes and boats, as well as property taxes that are not liens against the real property. Unincorporated Areas are those areas and communities that are outside the jurisdictional boundaries of incorporated cities. As such, they are not serviced by an incorporated city. County government serves as the "city" for these areas by providing basic municipal services such as law enforcement, zoning, building permits, libraries, parks, recreational programs, street maintenance, and traffic signals and stop signs. Special Districts are public agencies that provide specific services directly to local communities. View the list of Special Districts.